You don’t always have to reach for the stars. Following a lofty content marketing strategy can be exciting and successful, but sometimes it’s helpful to stay grounded and follow sound content marketing truisms. I’ve created a list of five “just-for-today” mandates in the hope that you can recharge those marketing batteries before your next starry voyage. Two men are walking through an African game reserve when they come across a lion. One of the men calmly puts down his backpack and slips on the running shoes he has been carrying. To wit, just being a little bit better, working a little harder, and being slightly more innovative can earn your brand the lion’s share of search engine ranking, social media attention, or stickiness to your website. Moving just one position in a Google page or having a slightly better infographic on Pinterest that people want to share may be all it takes for an epic conquest. All marketing campaigns take time to achieve warp speed. Being on the laser lanes of the web with content marketing is no different. Somewhere in between, content marketing efforts will take time but not light years. The point is not to wallow in anxiety, make rushed decisions, or expect instant gratification. In addition follow this important tip: Communicate about timing with clients and superiors who are on the stellar odyssey. Handley and Baer, standard-bearers for content marketing, are explaining that the marketing rules have changed: Buyers are smarter than ever, and companies that thrive in altruism and transparency are the ones that will outrun their competitors. In fact, Baer even gives examples in his book from companies like Hilton and Clorox, which actually shill for their competitors when it’s beneficial for their customers. Obviously, this doesn’t mean hand the keys to your competitors. Instead, simply be of complete service when it comes to assisting prospects or clients. You’ll probably realize or maybe even remember how good it feels to be helpful and how this attitude will reward you in various ways, like through work ethic and actual ROI. This may sound almost insulting to marketers of any stripe, as we frequently tend to go beyond reinventing the wheel to reinventing the very universe around us. Sometimes, however, it simply takes a one-degree shift in imagination, one further step outside the proverbial box to create results that will be like a new universe. 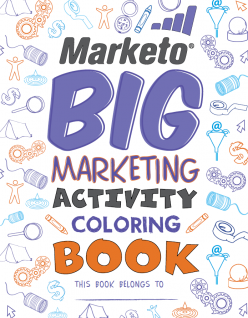 The Big Marketing Activity Coloring Book (is) a 30-page e-book marketers could print out to play a game of marketing automation mad libs, fill out a content marketing word search, and match drawings of influential marketers with the titles of the books they had written. This seemingly alien move by Marketo was atypical of the traditional e-book, white paper, or pitch deck regularly found on landing pages. Yet, according to Taube, it has beamed in over $500,000 in revenue for Marketo. In truth, a coloring book is a step down the maturity ladder, but our inner child is never too far away, wanting to be pleased. No, I’m not getting all contradictory. As content marketers, our imaginations are always replete with dilithium crystals – we tend to skip the coloring book idea and go right into a concept that requires a trip to Morocco to film a Star Wars parody with our company’s marketing slant. I contend it’s similar with content marketing. You may think you can reinvent the universe within the vast multiverse that is the Internet, but instead, you probably will find yourself building a back-firing Death Star. Thousands of market researchers and creative types spend hours every week trying to understand the consumer galaxies. It’s doubtful you’ll find that transporter that will beam up every client in the cosmos. So the pressure is off until inspiration tells you otherwise, and that will probably bring forth more inspiration. Work with what you have, thrive a little harder, shift a degree here and there, and accept a world of limitations, and you will likely find the success you deserve. If anything, going where no man has gone before will mean you’re not stuck in a black hole of worry but reaching the final frontier of a supernova tomorrow.